Four-time major winner Rory Mc Ilroy worked hard to take a share of the lead in the third round of the Abu Dhabi HSBC Golf Championship. 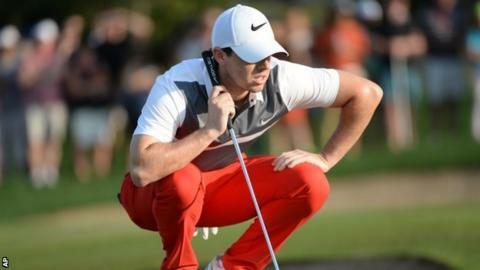 McIlroy was one of 60 players who had to finish their second rounds on Saturday. And the 26-year-old will have to complete his third round on Sunday. He is on 10 under along with Branden Grace of South Africa, England's Ian Poulter, American Rickie Fowler and Dutchman Joost Luiten. They are a shot clear of another group of five, including halfway leader Andy Sullivan of England. Sullivan had been two shots clear before losing a ball in a bush at the ninth, and the resulting triple-bogey seven dropped the 28-year-old to nine under alongside Belgium's Thomas Pieters, Sweden's Henrik Stenson, Robert Rock of England and Spain's Rafa Cabrera-Bello. McIlroy, who has four second places in the tournament in the last five years, finished off his second round in style with a birdie at the 17th, followed by a tap-in eagle at the 18th for a two-under 70. He started his third round well, picking up shots on the second and fourth holes, before his only bogey of the day on the fifth, but he then added another birdie on the eighth to move to 10 under. World number one Jordan Spieth, who is making his debut in the event, was one of only 13 players to complete their third rounds with the American winning a race against the clock to post a four-under round of 68 to move to seven under, just three shots off the pace. Spieth, who was warned for slow play on Thursday, completed the final hole of his third round alongside five other players in near-darkness in order to avoid an early return to the Abu Dhabi Golf Club on Sunday.